The widespread collapse of kelp forests off the Northern California coast has devastated abalone populations. California officials may close the 2018 abalone season. Abalone diving, a tradition among thousands of Californians, could soon become a thing of the past as numbers of North Coast red abalone freefall. The giant sea snails, which eat seaweed and kelp, have been left with little to eat after the North Coast's kelp forests collapsed during the past three years. Now, hundreds of thousands, if not millions, of abalone are dead or starving. In places where the sea snails used to be fat, healthy, and phenomenally abundant, there are few, if any, left, according to numerous accounts from recreational divers and researchers. Phil Sammet, a diver from Monterey, dove for abalone near Fort Ross in mid-October — what he believes was probably his last California abalone hunt. "It used to be covered with abalone on the bottom, and we saw one here, one there," Sammet said. The 2017 abalone fishing season closed at the end of October, and the harvest is in danger of not resuming next spring. The California Department of Fish and Wildlife has recommended that the lawmaking Fish and Game Commission close the 2018 season, according to Cynthia Catton, a biologist with the department. Catton, who works at the UC Davis Bodega Marine Laboratory, has closely studied the North Coast's red abalone population and its environment since 2002. "The department has recommended a full closure," she said. Catton said a decision will probably be made at the commission's upcoming Dec. 7 meeting in San Diego. A closure would hardly be unwarranted. While abalone densities have been declining slowly for years in certain locations largely due to unchecked poaching, the recent population plunge is a distinctly different and more alarming phenomenon. The crisis began about four years ago, when a disease wiped out the West Coast's sea stars. These creatures prey on sea urchins, and their absence has resulted in the proliferation of purple sea urchins. Urchins, like abalone, eat kelp, and the boom in the spiny echinoderms has driven the North Coast's bull kelp forests into collapse. Today, purple urchins cover the seafloor in extraordinary numbers from San Francisco and Marin counties at least as far north as Humboldt County and have turned previously lush kelp forests into a massive marine desert. The change has spelled doom for abalone, and divers who frequent the North Coast's waters have become familiar with the subsurface sight of withered, starving abalone and heaps of shells — basically abalone graveyards. Catton said underwater surveys have quantified the extent of the collapse. "Prior to the crisis, we would see about one empty shell per 100 live abs," she said. Now, in many places, empty shells litter the seafloor and outnumber live abalone by a ratio of 2-1, she said. At best, there are four live abalone per empty shell. "I never thought I would see these kinds of low densities on the North Coast," Catton said, noting that Southern California's abalone population has been depleted for years. There is hardly an abalone diver in California who has not seen the dwindling kelp, the proliferating urchins, and the starving abalone. Still, Bay Area diver Jon Edens said experienced divers can collect their limits of healthy abalone — if they know where to fish. "It depends on where you go — you have to find the places where the kelp is abundant, and the abalone are thriving in those places," said Edens, who owns the Marin Diving Center, a dive shop in San Rafael. Frank Hurd, Coastal Fisheries project director with The Nature Conservancy, is also optimistic. He has personally surveyed parts of the North Coast and says the severity of the situation has been overstated. He said that, even in some regions where the bull kelp has mostly disappeared, the abalone have not. "They've congregated in shallow water to the point where somebody doing a scuba survey wouldn't see them," Hurd said. Catton agreed that most surviving abalone have moved to shallower waters to seek intertidal vegetation. However, there is more to the story than that, she said: Depths beyond about 30 feet are out of range of most breath-holding abalone divers. As a result, the deeper waters have served for decades as a sort of ad hoc reserve, largely untouched by divers and a regenerative source for abalone. However, even this deeper water, Catton said, is now a dead zone. "The deep-water abalone are no longer there," she said, explaining they seem to have either died or moved into the shallows, where various turf seaweeds remain in relative abundance. 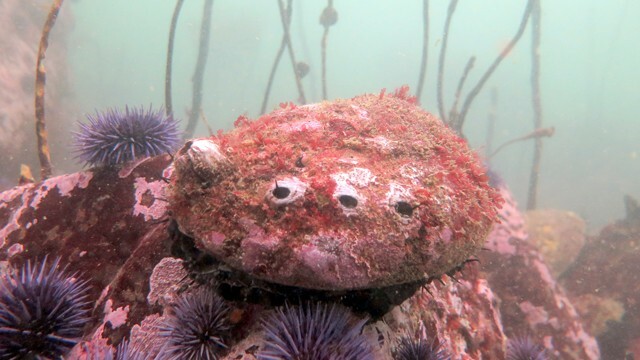 Catton's supervisor Sonke Mastrup, Department of Fish and Wildlife's environmental program manager for invertebrate fisheries, agrees that abalone abundance in shallow waters is a mirage. "You might have your patches of kelp where you can find abs, but patches don't make a healthy fishery," said Mastrup, an abalone diver himself. "When you look back at the abalone densities we had back in the mid-2000s — that is so far gone. In places, there are almost none left. This fishery is collapsing." Because sea urchins can survive long periods of time without food, their numbers are not declining. In fact, the animals are still reproducing — as evidenced by the seafloor presence of urchins as large as large as tennis balls and as small as marbles. In other parts of the world, such as Japan and the Aleutian Islands, kelp forests that have collapsed into urchin-dominated environments have persisted as such for decades. There is little reason to think Northern California's kelp forests will rebound anytime soon, Catton said.